Hello everyone, so it's time for a tutorial blog post. Recently I've seen a lot of popup box cards and I wanted to make some of my own, but I wanted to make sure that they could easily be put in an envelope. In this tutorial, I will be describing the process to create the basic structure of an A6 size popup box card. I used a half a sheet of A4 cardstock to make this card (I cut the paper vertically, so you should end up with two pieces of cardstock that are 11 3/4 inches by 4 1/8 inches. You only need one of these pieces to make a card, you can save the other for a future card. Now you will need to score (horizontally) a line at 2 1/16 inches from the bottom, and then cut all the scored lines above this line as shown below. The bottom part forms the panels of the box, the cut parts will form the flaps of the box. 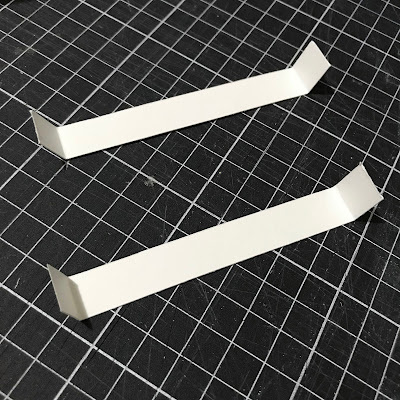 To create the tab, cut off the top part of the 1/4 inch strip as shown in the diagram above, then cut the edges of the tab at an angle and add some double sided to the tab (bottom-left). Then you can remove the release paper from the tape and adhere it to the other end of the panel to form a box! Note you should decorate the box panels/flaps before completing this step. 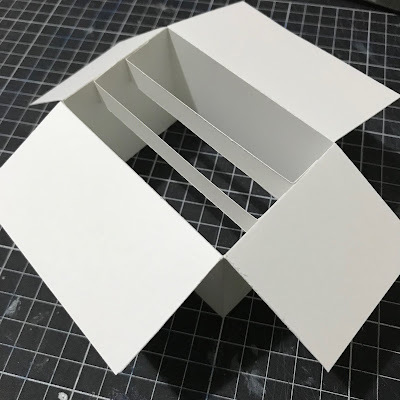 Finally, we want to be able to add some items to 'popup' in the box, to do this you will need two 4 1/2 inch x 1/2 inch strips of white cardstock. Note that the strips should be the colour/patterned paper on the inside of the box to make them as 'invisible' as possible. Of course, you could also use acetate strips! You will need to score these so they will have 1/2 inch tabs on each end, this will be the part which is adhered to the inside of the box. Before adhering these strips to the inside of the box you should add the decorations, the ones that you want to have 'popup' in the box, to these strips. So that's the basic structure of a popup box that fits in an A6 envelope. the fun part is decorating it with the papers and embellishments you want! I tend to use 'flatter' embellishments to these types of cards to minimise the 'bulk' of the card. This makes it easier to fit in an envelope! I think collectables are probably my favourites things to use to create these popup cards. Here's an example of a popup box card I made using the collectables from Kaisercraft's 'Sea Breeze' collectables. For this box I used three acetate strips to adhere the collectables to. This card will fit in an A6 or a C6 size envelope. Hope this tutorial helps you make your own popup box cards!